RWD Chief Engineer (West Zone) Taken Welly today carried out inspection of the under construction of Model Police Station . Rural Works Department officials led by Chief Engineer (West Zone) Taken Welly today carried out inspection of the ongoing construction of Model Police Station and Women Police station here at Bank Tinali today. 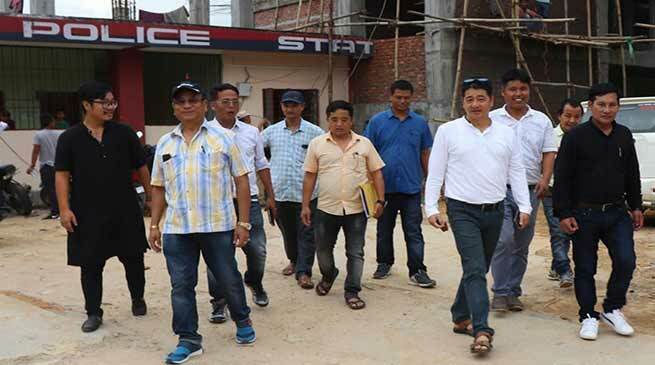 Welly while talking to Arunachal24 said that the Itanagar Police Station would be one of the best police station of the state and will have all facilities of Model Police Station of the country. He said that the construction work is on war footing and it is expected that the construction part is completed by December 2018. The present construction part is amounting to Rupees 6 crore and we have sent another proposal amounting to Rupees 2 crore for extension which shall have sufficient parking for vehicles, separate toilets for female and male with modern amenities so that anyone if come for a complaint may get rest room, reception room, strong room for keeping weapons, special features for ladies changing room, child care and computer room and room for IO, officers, crime branch and others facilities which the police department may like to included. We are only constructing the building and once it is completed it would look like a model police station wherein the women police station is also available in the same campus, Welly added. Itanagar Division Executive Engineer Techi Jobae, AE G Karbak among other engineer and officers from RWD were present on the occasion. Capital SP M Harsha Vardhan while inform that Itanagar PS is going to become a Model Police Station. Once the new building is ready, it will have reception desk, child friendly room, e-Malkhana among a host of other innovations. The special provisions and features are being taken to help police personals to work smoothly at Police station and under the guidance of DGP SBK Singh we are making preparations to make the Police Station into a Model PS. Sp added.